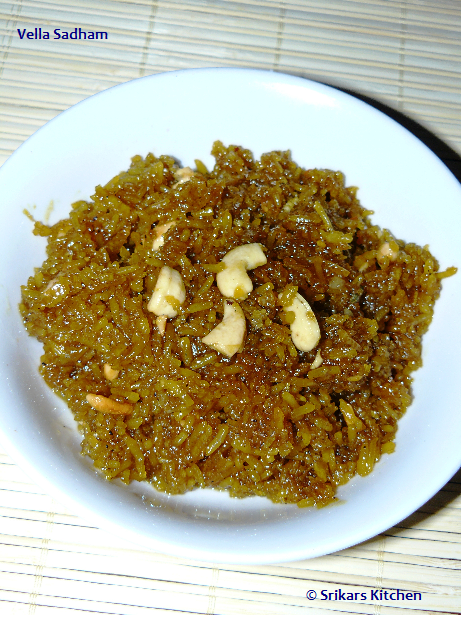 Vella sadham- this sweet rice is made with jaggery. This easy to make and tastes similar to sakkarai pongal. Normally my mom makes this rice on Adi perukku day and Navrathiri days.I love this very much becoz of the taste of jaggery and coconut. Heat the jaggery with water & strain it. Again allow to boil, add grated coconut & mix well. Add cooked rice, Mix well & allow to cook in medium flame. Add cardamom powder & mix well. Heat ghee in a pan add cashew nuts & allow to roast . Add to the rice & mix well. Delicious and mouth watering Jaggery rice! வெல்லச்சாதம் இனிமை, அருமை, பார்க்கவே ருசியோ ருசி. பகிர்வுக்கு நன்றிகள்.